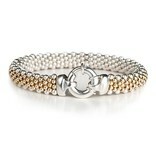 A truly timeless & gorgeous reversible bracelet, The Classic is 1/4" wide with Sterling Silver & 14K gold beads. Like the friendships we share, the women we are, Dovera Bracelets are as meaningful as they are gorgeous. Made in the USA by Dovera Designs.